I'll be frank. My teeth are, for all intents and purposes, gone. Long story short: trauma + stupidity + lack of health care + me = I'm in trouble. Short story long: I was involved in an accident when I was very young, which has led me to have a rather severe issue with people being near my face, especially moving around. On top of that, I once woke up while having a tooth pulled - again, as a child. Between the two of those, as well as never being well off enough to be able to afford health care, much less dental insurance, my teeth have suffered. Then it got worse. About twelve years ago, I was working at a gas station. While I was stocking the cooler, I had a shelf hit me in the mouth. I was fortunate that the shelf wasn't fully loaded, and at the time, I thought the only damage was a cut lip. I didn't know how the whole worker's comp thing worked back then, and I thought that if I reported the accident, my manager would get in trouble. My manager was one of those rare likable managers, and I didn't want that to happen, so I said nothing. About two weeks later, I noticed that my tooth was cracked. I couldn't really do anything about it though, I had no insurance to see a dentist. It eventually rotted out. And then the rest started to go, too. I have gotten to the point, now, where the dentists I've been able to scrape up the money for (and who were able to work with my trauma), have told me that my teeth are a total loss. Due to my "young" age (36), the dentist recommends that the teeth all be surgically removed and implant supported dentures be put into place. 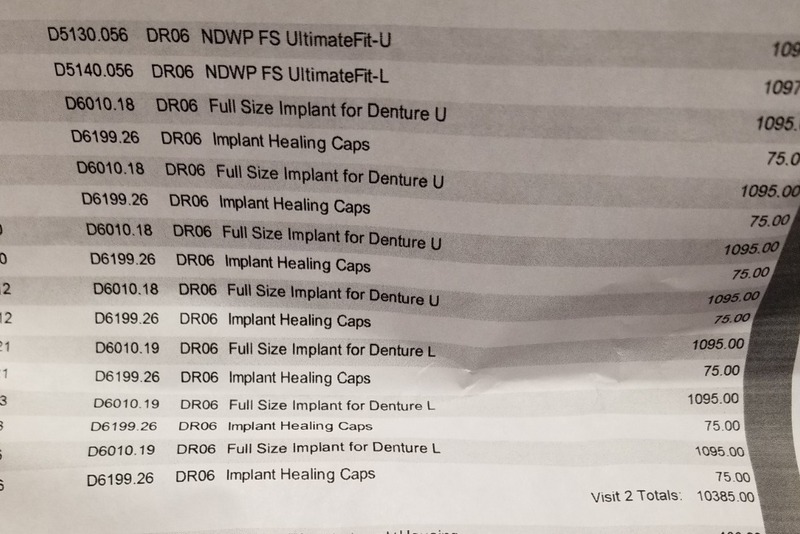 He drafted up a plan to put in seven (7) implants - four upper, 3 lower - each one costing, roughly $1,270 (including healing caps and abutments). The dentures are both another $1097 apiece. The dentist has been extremely kind enough that he's already offered to only charge $300 to surgically remove all of the teeth, and to provide oral sedation in order for an actual anesthesiologist to give me an IV (I can handle shots, but I end up having panic attacks when IVs get involved). He's willing to eat almost $1,400 to help me, but even with his generosity, the bill still comes up to over $10,000, which, I just do not have. 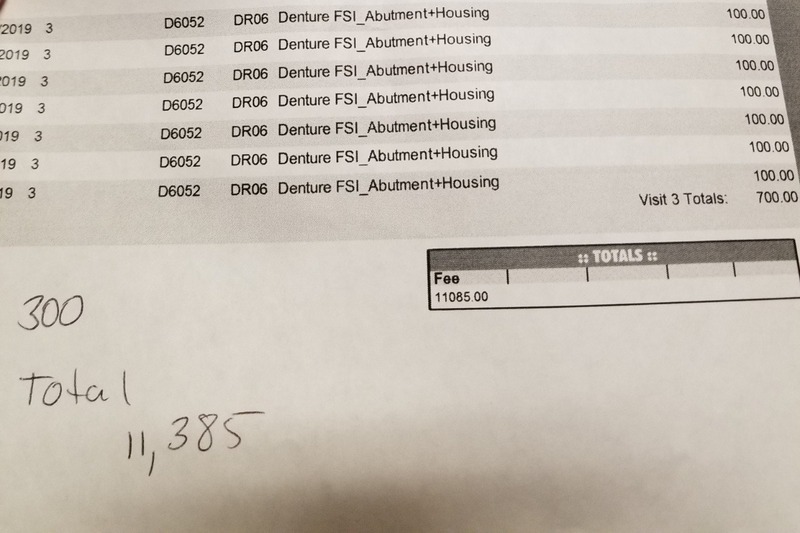 As you can see, I am not asking for anything more than what the dentist is charging (the "+300, Total 11,385" is a note for/from the dentist regarding the $300 for the extractions). I do not want to ask for help. I recognize that it was my own foolishness that got me where I am now, and there are so many other people who need the money, too, but I have no choice. Because here's the big thing: doctors now know that bad teeth have a direct correlation to heart disease, and heart disease isn't exactly rare in my family. Heart disease can lead to heart attacks and strokes. My father suffered a heart attack when he only slightly older than I am right now (he might've had more before then, but I'm going based on what I know for sure). He also died of a stroke when he was only 50. His teeth were barely better than mine are now. I don't know if he would've lived longer if his teeth had been taken care of. All I know is that I don't want to risk it. I want to live past 50. I would like to reach my goal by the end of the year. I don't know how long the dentist's generosity will last, and I want to try and get this done ASAP. I already plan on picking up more hours at work to reach the needed amount, and will, of course, keep people updated on if the amount needed goes down. I really don't know what else to say. If you donate, thank you so much! If you don't, that's fine, too. Please look at some of the other people who need help, and consider donating to them, instead.